Just because our teens don’t believe in the Easter Bunny anymore, doesn’t mean we can’t spoil them with a few little gifts! *This post may contain affiliate links. This means , at no additional cost to you, we will earn a small commission if you click the link and make a purchase. Most of the posts that I tried to find to link to this article had really silly ideas for teens at Easter, so here are some that we came up with ourselves. Involve your teens in the planning of this holiday. They love to help with the younger kids. 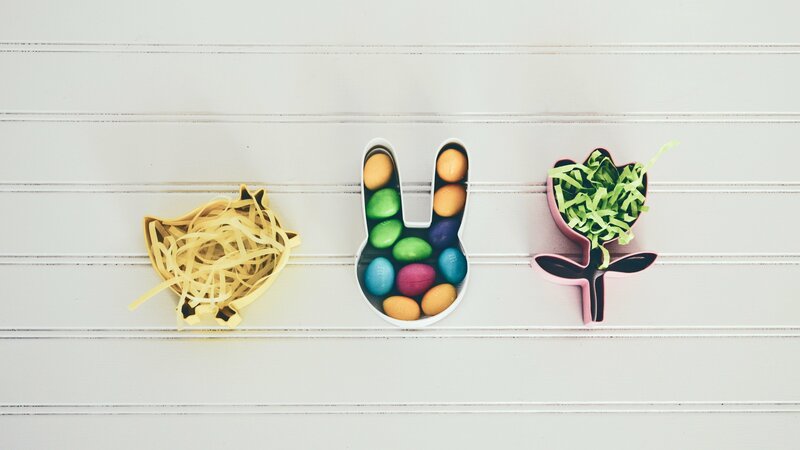 Decorate and hide the eggs. Stuff plastic eggs for younger siblings. Help your teen find a volunteer opportunity for your teen at church or with your city. Visit an assisted living facility and give little treats to the elderly. Watch Passion of the Christ as a family and discuss the meaning of this important holiday. (Caution, this is for older teens.) And, for fun, watch Hop for some lighthearted fun! Candy–Get creative, there are lots of silly candies that guys would like! Cards/Dice –A great game for study breaks going into finals! Razor/Shaving gel –If you buy it, they won’t have to! New earphones –My son just spent some of his earnings on a new pair, and he loves these! Video game –My whole group of guys LOVE this game! Money/Giftcards — These are for food, always an easy and much appreciated gift! Candy— Organic jelly beans for your sweet girl! Nail polish –In fun spring colors! Earbud Splitter –Great to listen with a friend, and it’s in a bunny shape for Easter! Lipgloss –I know your daughter will appreciate this gift at all times! Journal –Have you heard of the enneagram self discovery system? It’s pretty cool! Flip flops –These are sooooo comfy! Money/Giftcards –These are for shopping, again, always a sure win! No matter if your teen is still home or far away, these gift choices should help you out while you plan their Easter. Pack up a quick care package or arrange a basket for home. Good luck and happy Easter! Forget the kids, I’d like all the gal gifts please and the headphones Great list. HA! I know:) Feel free to share this list with your spouse or significant other as well! I asked my nieces and sons, and tried to choose some reasonable priced items. Glad you like the list. These are nice gift ideas. It is always hard for me to shop for teens. This is very helpful! Thank you! Our sons and daughters approved the list. Thank you! I love finding great gifts for their baskets:) I am still needing to get them together for my boys!